Many thanks to Suzanne Wray, moving panorama historian, for her help in putting this bibliography together. Published by the New Bedford Whaling Museum, New Bedford, MA, 2018. Volume I is a collection of articles written by the museum's staff. 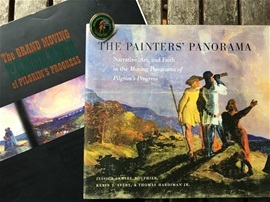 It tells about the artists, Benjamin Russell and Caleb Purrington; general moving panorama history; an overview of the content of the moving panorama and the restoration/conservation processes that were used. 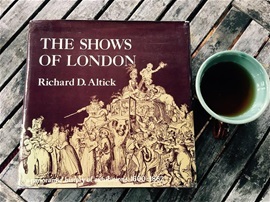 Altick, Richard D., "The Shows of London, A Panoramic History of Exhibitions, 1600-1862", The Belknap Press of Harvard Univ. Press, Cambridge, MA, 1978. City Art Museum of St. Louis, "Mississippi Panorama", Von Hoffman Press, 1950. McDermott, John Frances, "The Lost Panoramas of the Mississippi, The University of Chicago Press, 1958. 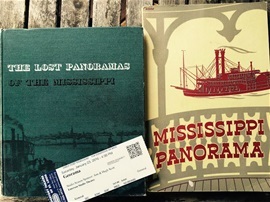 For more information on Mississppi River Panoramas, visit The Crankie Factory's page, Mississippi Panoramas. 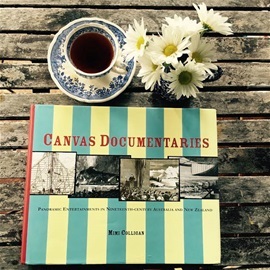 Colligan, Mimi, "Canvas Documentaries, Panoramic Entertainments in Nineteenth-Century Australia and New Zealand", Melbourne University Press, 2002. Huhtamo, Erkki, "Illusions in Motion, Media Archaeology of the Moving Panorama and Related Spectacles" MIT Press, 2013. 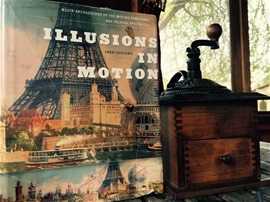 For more information on this book, visit The Crankie Factory's Illusions in Motion page. Hyde, Ralph, "Panoramania! The Art and Entertainment of the ‘All-Embracing View’",Trefoil Publications, London in association w/ Barbican Art Gallery, London, 1988. Ralph was one of the most knowledgable moving panorama historians. Sadly, he passed away in June, 2015 and is greatly missed. He leaves behind a mountain of valuable research. For more information about his works, visit the Crankie Factory's page on Ralph Hyde. 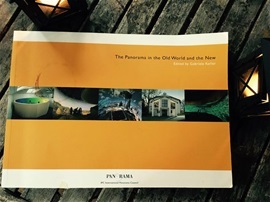 International Panorama Council, Edited by Gabriel Koller, "The Panorama in the Old World and the New, Deutsche Nationalbibliothek, 2010. A collection of articles written by IPC members. Many are mentioned in this website including Russell Potter, Erkki Hutamo, Peter Morelli, Ralph Hyde, Sara Velas, Mimi Colligan and Michael Dyer. Potter, Russell A., "Arctic Spectacles: The Frozen North in Visual Culture, 1818-1875", Univ. of Washington Press, 2007. For more information on Russell's research, visit The Crankie Factory's page on Polar Panoramas. 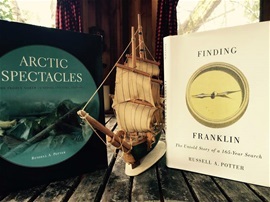 The second book by Russell, Finding Franklin, The Untold Story of a 165-Year Search, (published in 2016) is not about moving panoramas, but I included it here in case you have an interest in this subject. One incredible coincidence, is that the day the book was released on the market, was the day the second ship was discovered! 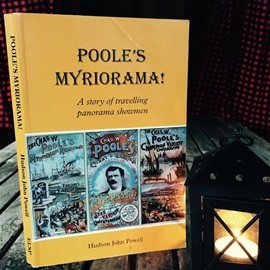 Powell, Hudson John, "Poole’s Myriorama! 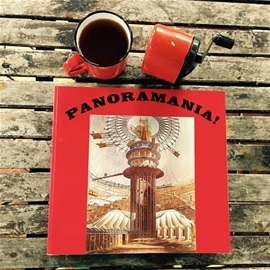 A Story of Traveling Panorama Showmen", ELSP, Bradford on Avon, Wiltshire, 2002. Favorite passage: Anything could happen at a myriorama (moving panorama) show. It was not unknown for the scenery to be accidentally set alight. One one occasion when too much gunpowder was used for the "Bombardment of Alexandria" at the Colston Hall, Bristol, parts of the plaster ceiling came down! Fortunately there were never any fatalities. 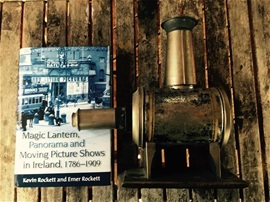 Kevin Rockett and Emer Rockett, "Magic Lantern, Panorama and Moving Picture Shows in Ireland, 1786-1909", Four Courts Press, 2011. 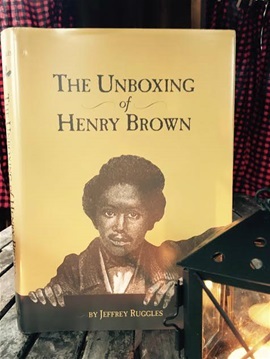 Ruggles, Jeffrey," The Unboxing of Henry Brown", Library of Virginia, Richmond,Virginia, 2003. 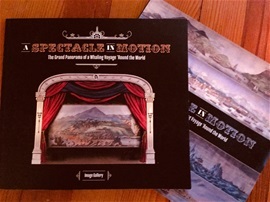 For more information about this truly incredible moving panorama showman, and the book written by Jeffrey Ruggles, visit The Crankie Factory's page on Henry Box Brown. This moving panorama survives and is housed at the Saco Museum in Saco, Maine. A reproduction was made because the original is too fragile to crank. I had the great fortune to be able to see one of the performances in 2015. The J. Paul Getty Museum, "Carmontelle's Landscape Transparencies: Cinema of the Enlightenment", Getty Publications, 2008. Several of the 18th Century "crankie-sized" panoramas have survived and are housed at the Getty Museum in Los Angleles. 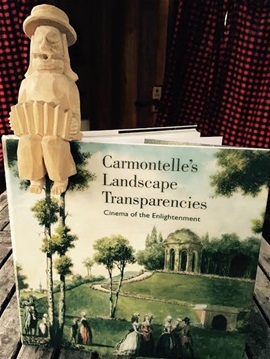 For more inforation, visit The Crankie Factory's page on Louis Carmontelle.